Who wins? NJ legislature has passed a ban on fracking for natural gas, while NY has moved to lift its ban. Another astonishing space photograph, this time from lunar orbit, taken by Lunar Reconnaissance Orbiter on June 11, 2011. 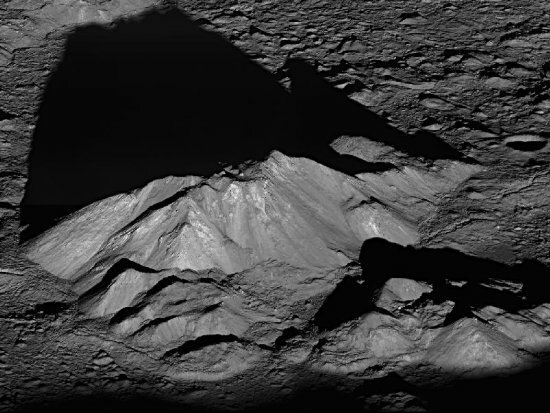 The image looks down at the central peak of Tycho crater, with enough detail to make out individual boulders at the summit. Go the link to see some closeups. A “dirty hack” has restored the Cluster solar wind mission from near loss. The image below was taken on January 11, 2011 by the space probe Cassini, in orbit around Saturn. 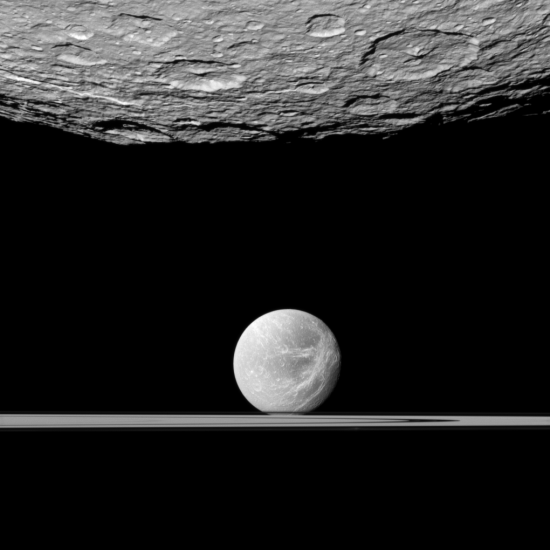 First we see the southern polar regions of the moon Rhea, 949 miles in diameter. Beyond is the moon Dione, 698 miles across, appearing to sit on the rings of Saturn. As far as I am concerned, this image, as well as almost every other image from Cassini, proves that any hotel built in orbit around Saturn is unquestionably going to be one of the hottest tourist spots in the solar system. This is funny: Obama’s attack of corporate tax breaks for private jets was an attack on something actually reauthorized by his stimulus package. An new Harvard study finds a political congruence between patriotism promoted on Fourth of July and the values associated with the Republican party. I think this study says a lot more about the perceived values of the modern Democratic Party, and how many imagine them as almost being hostile to this country and its founding principles. The Obama administration is offering another billion in free money to homeowners who can’t pay their mortgage. So, considering the trillions in debt that is overwhelming the budget of the federal government, I wonder where is billion dollars coming from. Do they grow it on trees? I’d really like to know, since it would be nice if I could manufacture cash out of thin air as easily whenever I thought I needed it. A new technique gives clues to the original living colors of ancient fossils. Texas congressman demands the firing of VA cemetery director for denying mourners their first amendment rights. The TSA hard at work: A man successfully boarded and disembarked from a flight, without a valid passport or ID. Another federal judge has ordered the Obama administration to stop stalling and start issuing oil and gas leases, as required by law. To this administration, the law is such an inconvenient thing. A massive Windows botnet is “almost indestructible,” say researchers. Obama’s proposal to end the tax break for corporate jet owners would reduce the deficit by less than one-tenth of 1 percent. A dose of reality: Obama’s repeated demand at yesterday’s press conference to end the tax break for corporate jet owners would reduce the deficit by less than one-tenth of 1 percent. I say, the Republicans should trade this measly tax increase for $1 trillion in cuts. This tax increase is stupid, and will do nothing bu harm, but if they can trade it for lots of cuts, it’s worth accepting it. NASA funding mired in budget politics. Obama and Republicans in agreement: The Senate should cancel next week’s vacation. Using the law against Hamas and their flotilla allies. Already, the number of flotillistas has been whittled down from 1500 to 350, and the number of boats from 15 to ten. Most of the credit should surely go to the Israeli activist law firm Shurat haDin which believes in bankrupting terrorism through a creative use of the law. Biosphere 2 gets a new owner and a boost in funding. We’re here to help you: The EPA has approved a warning label for its approval of 15% ethanol gasoline. Capitalism in space: China has purchased a three Earth observation satellite constellation from a United Kingdom firm. The launch of a military satellite out of Wallops Island, Maryland has been delayed until Wednesday.